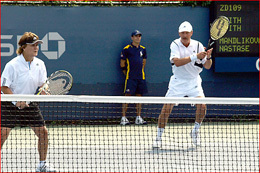 2008 US Open Champions Invitational. A scorching final day of the Champions Invitational showcased three matches of former Grand Slam greats. First up were Henri Leconte and Jimmy Arias. Arias, in his usual cheery mood, kept up an ongoing chatter throughout the match – and not only between points, but during points as well. He toyed with Leconte’s psyche during one particularly long rally shouting, “You’re going to miss first!” And Leconte did, much to the amusement of the fans. Undeterred, they pressed on in the sweltering heat, and Leconte who had struggled in his two previous matches, pulled out his first win of the tournament in the super tiebreak, with a final score of 4-6, 6-3, 10-5. Immediately following was Jana Novotna against Conchita Martinez. Slightly more sedate from the outset than their earlier male counterparts, their match was curtailed when, with Novotna up one set, 6-2, Martinez was forced to retire due to a foot injury. Then it was time for the mixed doubles. 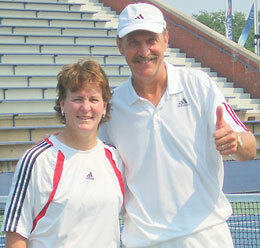 In the late afternoon, Anne Smith and Stan Smith faced off opposite Ilana Kloss and Guillermo Vilas. With Billie Jean King watching courtside, the four gave a great show to the crowd on hand. A fast-paced and hard-hitting contest, it was obvious that in addition to having fun, both sides were totally focused on getting the win. There were long rallies, hard-fought and rapid-fire net volleys, and serves that were impossible to return. After splitting sets, Smith and Smith held on to win the super tiebreak and chalk up their second win of the tournament, 7-6, 3-6, 13-11. The Champions Invitational officially concludes tonight with Todd Martin taking on Pat Cash in Arthur Ashe Stadium, immediately following the women’s singles final.